This seems like a good book to use for my first post, because it was an absolute favorite in my family. It was my older daughter’s first favorite book, and my younger daughter loved it, too- as did I. In fact, it is one of the books I set aside and did not give away when my kids outgrew it. 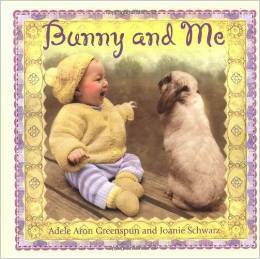 The story follows a baby and a bunny who are playing together… until the bunny hops away. The baby is distraught and searches for bunny, and is then overjoyed when bunny is found. In the toddler phase of loving this book, my kids would “help” search for the bunny and would say the “there’s bunny!” line with me. In short, this is a sweet, simple story that really drew my kids in when they were quite young.